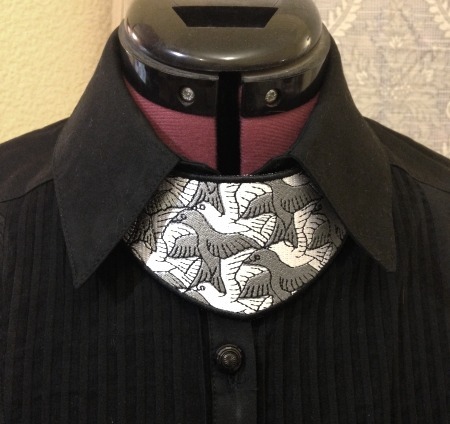 These are instructions on how to make the Birds Gorget Collar in the Hoop. 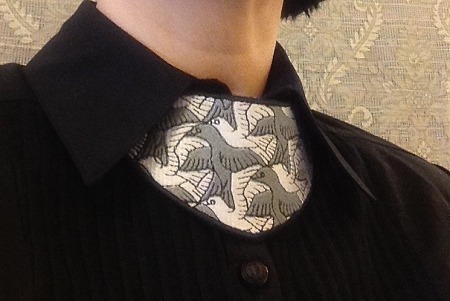 This fashionable accent will turn any blouse into a unique and attractive outfit. If you don't have the jewelry findings and tools available, you can use a piece of elastic 1/2" wide, preferrably matching your embroidery. Select threads for your embroidery. You can choose any colors you like. To embroider a design similar to the one in our pictures, you need to use three shades of gray (light, darker, darkest) and black. Colors 1, 2 and 6 on the color card show the auxiliary colors. The color of the thread doesn't matter for these. For colors 1 and 2, thread the 3rd color right away. Color 6 can be embroidered with either the 5th or 7th color. Step One: Hoop the medium-weight cut-away stabilizer. 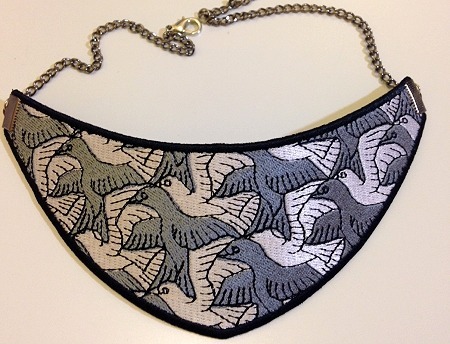 Upload the design into the machine and start embroidering. 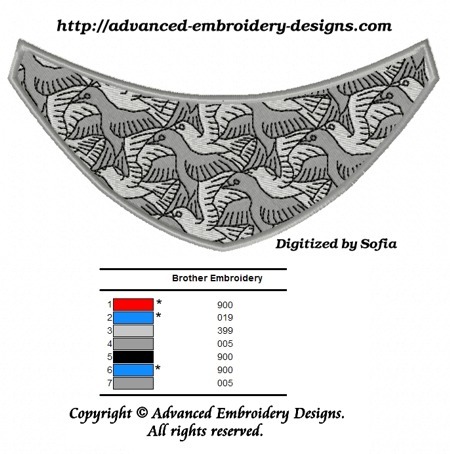 The first color will embroider the outline of the gorget and stop. 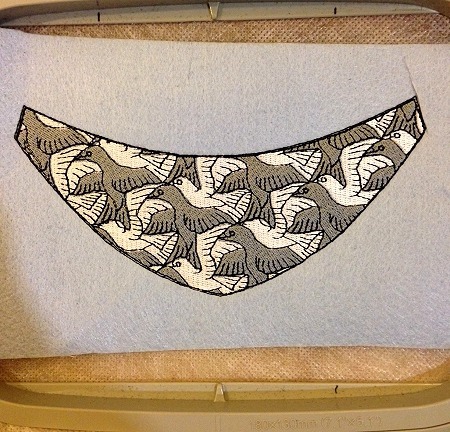 Cover the outline with a piece of thick non-fraying fabric. Embroider colors 3 through 5. Step Two: Take the hoop from the machine. DO NOT open it! With a pair of sharp scissors, cut away the excess fabric around the stitch-out as close to the embroidery as possible. 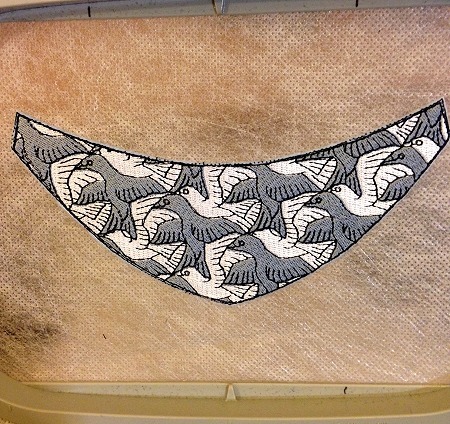 Step Three: Cover the back of the embroidery with the lining, right side up. 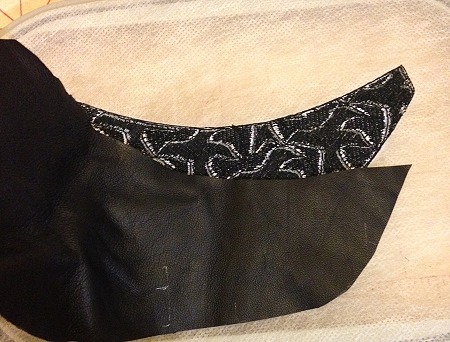 Pin or tape the edges of the lining outside the embroidery area. Step Three: Start the machine. 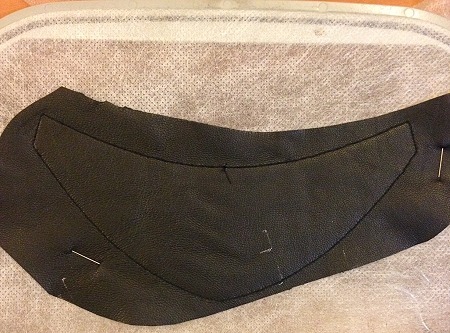 The sixth color will attach the lining to the working piece. 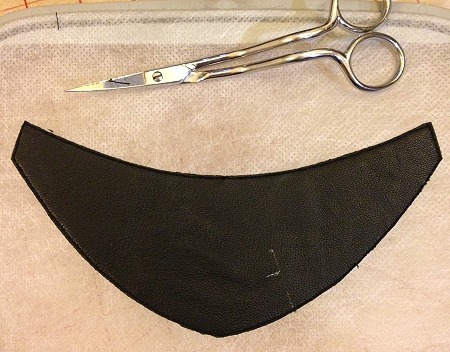 Step Five: With a pair of sharp scissors, cut the excess lining as close to the stitches as possible. Step Six: Return the hoop to the machine. Embroider the last color.Take the work from the hoop. 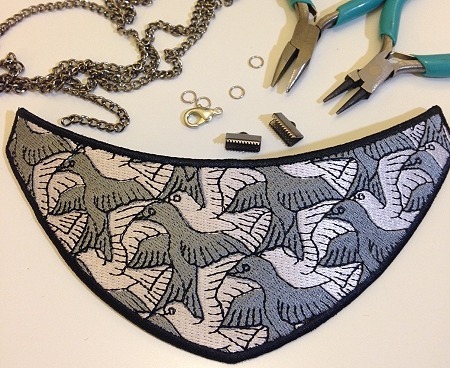 With a pair of sharp scissors, cut out the stitch-out. Step Seven: Using jewelry tools and findings, attach the clasp to the chains, then attach chains to the ribbon ends. Finally, attach the chain to the ends of the gorget using the ribbon ends.